For each of these items, just add each item that you would like to your cart and checkout. Shipping is FREE! These are available again to order! 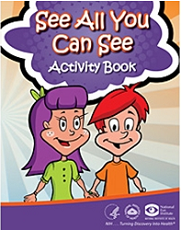 Get a FREE See All You Can See Activity Book! Get a FREE Eye Safety at Work Magnet! Get a FREE See All You Can See Fun Fact Calendar! Get a FREE Eye Facts for Children Poster! Get a FREE Children’s Eye Safety Gear Up! Poster! this is great.this sight is fantastic. Thank u! I was able to order sum stuff for my nieces!